이 백자 사각발형 제기는 마치 화분과 같이 넓고 깊은 푼주형태를 사면을 눌러서 둥근 사면형으로 만든 것이다. 입술 전 부분과 네 면은 넓은 칼로써 툭툭 깎아서 마치 목제품을 자귀로 깍은 듯한 표면을 만들었다. 굽은 ‘ㄱ’자형을 밑바닥 네 군데에 붙여서 만들었고 접지면에 유약을 긁어낸 후 모래를 받쳐 구웠다. 목공예품의 형식과 제작방법이 응용되었다는 점에서 중요한 가치를 갖고 있으며 이러한 제작·장식 기법이 현대도자에서도 자주 응용되고 있고 조선백자의 새로운 성격을 보여준다는 면에서 높게 평가된다. 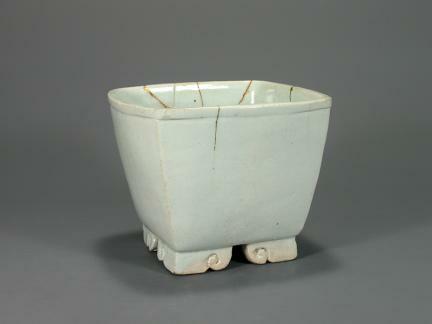 This white porcelain ritual vessel has the shape of a square shallow bowl with a wide rim. It is not a perfect square as the four sides have been pressed so as to make them slightly rounded. The mouth and the four sides of the body were carved with a large knife in much the same way that wooden wares are cut with an adze. The body is supported by four ㄱ-shaped feet at the four corners; and sand spur marks are visible on the underside of the feet where the glaze has been scraped off. This piece is an invaluable artifact as it represents a new style of white porcelain of the Joseon Dynasty in which certain decorative and manufacturing techniques used in woodwork (that are also frequently applied in modern ceramics techniques) were applied during its production.